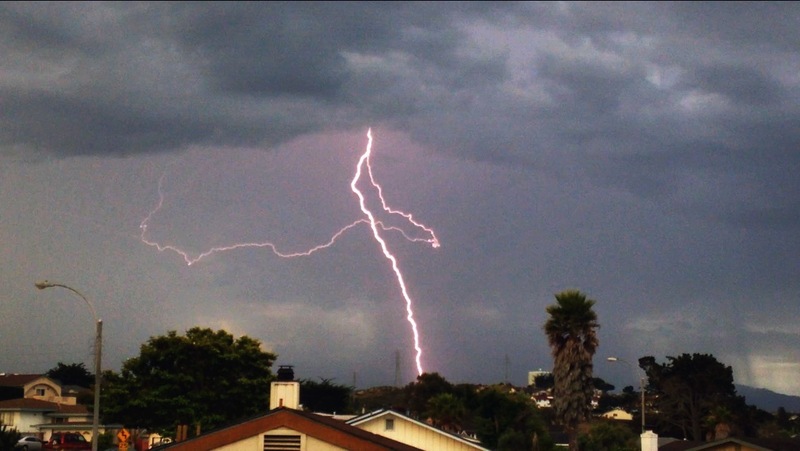 The remnants of Hurricane Dolores, which brought intense thunderstorms to Southern California yesterday, reached the Northern Santa Lucias, Carmel Valley, and the Monterey Peninsula early this morning. While heavy rain fell in some areas, it doesn’t appear to have lasted long enough to produce significant totals. No Monterey County rain gauge seems to have received much more than a couple tenths of an inch, and most received only hundredths of an inch. With the extremely dry conditions preceding the storm, the low rain totals, and the very large number of downstrikes, there is obviously a danger of fires emerging over the next few days – so hopefully more rain is on the way. A fire did break out at Pt. Lobos during the height of the storm this morning, but with heavy rain in the area, and a quick response by firefighters, it didn’t last long. 10:15 am Update: A fire has now been reported on the east side of Post Summit, above the South Fork of the Little Sur River. Fortunately another large band of rain is working its way up the coast. The leading edge is currently just south of Gorda. Hopefully, it will make it up here soon. 12:30 pm Update: The Post Fire is now reported to be 5 acres. The next band of rain is still moving (slowly) toward it. 8:45 pm Update: The Fire Formerly Known as the Post Fire has apparently been put out, or gone out. There’s been no word from the Forest Service that I’m aware of, but they have released the resources that were assigned to it and even, apparently, stripped it of it’s name. In addition, people like Branham (see comments below) who are well positioned to see something if there’s something to see, report no sign of smoke or fire fighting activity. There are probably other strike locations still smoldering out there. Let’s just hope things stay damp until they go out. This morning’s view from Seaside (Tim Jensen photo). 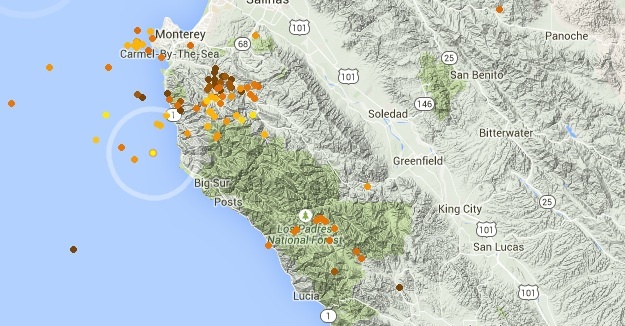 This entry was posted on Sunday, July 19th, 2015 at 9:15 am and is filed under Big Sur, Fire, Santa Lucias. You can follow any responses to this entry through the RSS 2.0 feed. You can leave a response, or trackback from your own site. Our rain gauge here is at 0.6″: it is still raining. I saw a helicopter about an hour and a half ago up here an North Coast Ridge Road. I can’t see any smoke plumes anywhere or in the area where the strike has been reported.There is haze in the Big Sur Valley and south as well so could be weather haze? Only sprinkles a few times this morning.